Located on the east side of the Des Moines River in downtown Des Moines, the East Village begins at the Des Moines River and extends east to the Iowa Capitol Complex (East 14th Street). The northern edge of the neighborhood is Interstate I-235, and the southern border is the Des Moines River. 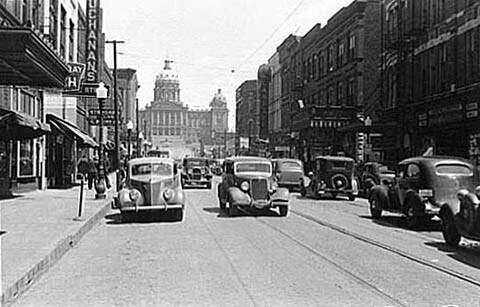 As one of the original commerce areas of Des Moines, East Village encompasses some of Iowa’s most significant buildings, including the State Capitol and numerous buildings on the National Register of Historic Places. In 2000, the City of Des Moines slated several buildings in the neighborhood for demolition. However, a dedicated group of individuals came together to advocate saving the buildings. Many of them stand today and are home to popular eateries, boutiques and loft-style housing. 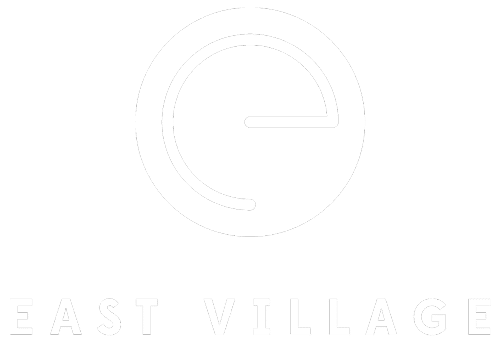 The East Village is a work in progress but one thing is for sure: The neighborhood offers a bit of culture, character and eclectic charm that comes from a history that extends well over 150 years! 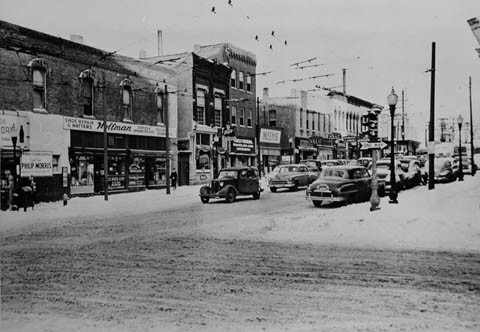 Enjoy the following images of the East Village (courtesy of the State Historical Society of Iowa)! Photo depicts current East Village area. Des Moines River can be seen in the background. Churches include: Lutheran Church (1885), St. Mary’s Catholic Church (2nd & Crocker), & Swedish Lutheran Church (E. 5th/Des Moines St.). In the lower left hand corner, the bell tower from Bryant School can be seen. Today, a stone on the State Capitol grounds marks where the school once stood. 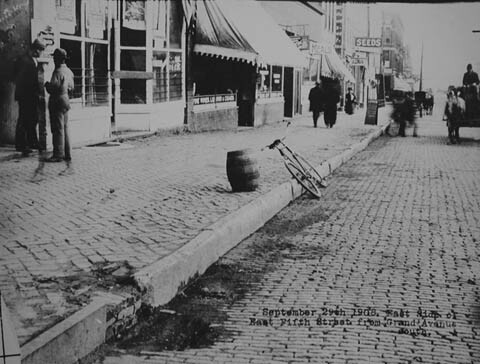 Note the dirt streets and horse on left with blindfold. Right foreground is Capitol City Bank. The rest of the buildings in this area were built in the 1870s and 1880s when Des Moines’ east side was experiencing a commercial boom. Photo shows tavern, restaurant, drug store and hardware store. Note beer keg and bicycle on sidewalk. Behind bus is Hammer Drug and Hast’s Meat Market. Note “Eat Colonial” bread advertisement on front of bus. Introduction of Locust Street as a one-way street. Photo taken facing north from in front of current Noodle Zoo restaurant. Shown at left would be Scandia Bank building parking lot. Further to the north is the current Gong Fu Tea building. The cornerstone of the Iowa State Capitol, more commonly called the Statehouse, was laid on Nov. 23, 1871. It was dedicated on Jan. 17, 1884, and completed around 1886. This is the fifth building to house the state government. The almost palatial decoration, inside and out, contrasts sharply with its function as the seat of a rural, republican government. However, such a structure was in keeping not only with contemporary architectural enthusiasms, but with people’s pride in their system of government and a belief that its workings should be respectfully housed. Built in 1915-16, the Northwestern Hotel was specifically designed to lodge railroad employees and others of modest means, and the principal decoration is therefore limited to the lobby area. A restaurant, cigar stand, and drug store flanked this central space. On the second floor was a ballroom with its own skylight, as well as guest rooms. Guest rooms on the second and third floors were arranged around the skylit spaces and were generally small without private bathrooms. Some of the larger suites, generally those with a view of the Capitol, had their own baths. After some years of slow decline, a group of attorneys purchased the building in 1983 and converted it into office spaces. The building contains retail space along the first floor, including Domestica. This building, erected in 1898, is one of the few examples of the cast-iron column structure in the city of Des Moines. Cast iron is stronger and lighter than stone and brick, meaning there was less material needed for the job. It is less vulnerable to fire and offered a stylish ornamental appeal for the architectural purposes of the Victorian age. The building originally housed Dockstader & Co., a dry goods store, from 1899-1915. After standing empty for many years, the property was finally purchased and renovated in 1999. It is now home to Wooly’s, an entertainment venue, on the first floor and commercial space on the remaining floors. In 1911, Horace E. Teachout, an “east side visionary,” began plans for what would be the tallest commercial building on the east side. An East Des Moines booster, Teachout supported development that provided a first-rate commercial core near the river and at the foot of the State Capitol. 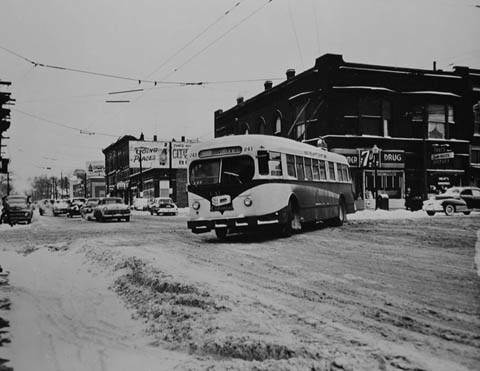 However, the construction of MacVicar freeway became a physical barrier and allowed residents and efficient means to access other commercial destinations within the city and the western suburbs. The building was a candidate for renovation in the 1970s, and its owners demolished interior partitions and installed HVAC systems, but did not go through with remodeling. Although the ground floors of the building were occupied by a company known as Flightags, floors 3-6, loaded with debris, stood vacant for years, entirely unoccupied and unserviceable from 1974 until its renovation in the late 1990s. The Teachout building currently is home to Velvet Coat on the first floor, Up/Down Arcade in the basement and commercial tenants on the upper floors. 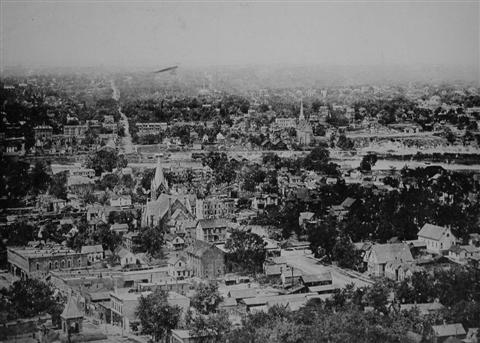 With both mobile and resident populations on the East Side, well-connected businessmen began to look at land along E. 5th Street for redevelopment. Conrad Dietz, a 67-year-old German farmer and one of the first settlers to Polk County in 1847, was an East Side landowner who owned nearly half a block of land along E. 5th and E. Locust. Though he acquired the land nearly 30 years earlier, Dietz had only sold one lot, in 1876 to the hardware firm of Entwistle & O’Dea. Dietz leased the rest of his land to various shopkeepers and craftsmen. 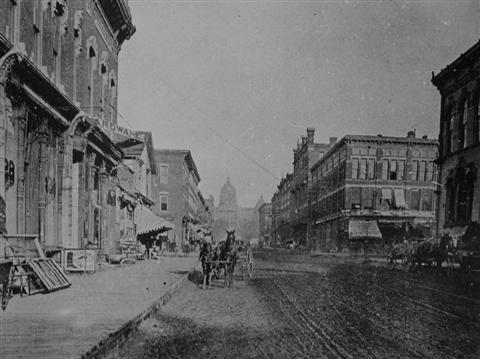 In 1883, 5th street near its intersection with East Locust, sported a row of small wood-frame store buildings and retained the appearance of an early village Main Street. The building presently houses Projects Contemporary Furniture, Jett and Monkey’s Dog Shoppe, Ephemera and gēnus landscape architects on the first floor. Capitol Village Lofts condominiums are located on the upper floors. The Studio building was built in 1878 for George R. Baker, and has housed a variety of commercial enterprises during its history. Until about 1895, grocers and druggists were prominent tenants. Subsequently, the building contained a series of undertaker’s parlors and furniture stores. Currently, the building houses several retailers, private offices and residences. Formerly the site of the State Historical Building and currently housing the State Library, this building was designed by O.O Smith in 1898. This example of Beaux Arts classicism is among the oldest structures on the Capitol Complex. The State Historical Department was formally established by the state legislature in 1892, and was, at first, housed in three rooms of the State Capitol. In 1899, the department moved into the building and stayed there until the new historical building was completed in 1987. The building recently underwent historic renovation and was renamed the Ola Babcock Miller Building, in honor of Iowa’s first female Secretary of State and founder of the Iowa State Patrol. The Municipal Building is significant for its architecture, and for its association with the form of municipal administration best known as the Des Moines Plan of Government by Commission, adopted in 1907. The Municipal Building, built in 1909-1910 to house the new form of government, was then viewed as a symbol of Des Moines’ commitment to progress and change. City offices remain housed in the building today.